Climate change campaigners have been involved in minor scuffles with police as they targeted the offices of Heathrow Airport operator BAA. The BAA protest forms part of 24 hours of "direct action" by the Camp for Climate Action near the airport. Eight protesters were later arrested after blockading British Airways' world cargo centre on Sunday night. 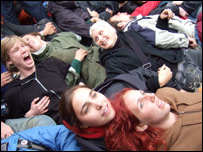 The demonstrators were lying on the ground in a circle with their arms encased in steel tubing. The group stopped vehicles getting into the Eastern Perimeter Road depot in a protest they claimed was highlighting how transporting food by air is contributing to climate change. Organisers say 1,400 people have been taking part in the day of action, while police at the scene put the number at about 1,000. The BBC's Megan Lane, at the BAA offices near the west London airport, said there was a stand-off between the two sides as dusk fell on Sunday evening. About 100 protesters were sitting down at the entrance to the headquarters' car park, in the hope of blocking BAA staff from coming into work. A further 100 or so protesters were supporting those sitting down in the entrance, in Bath Road. Police said if protesters blocked a public highway, they risked being arrested. Officers moved about 10 protesters, before allowing those clearly inside the grounds to stay. Earlier, 50 protesters were contained in nearby Mondial Way, following confrontations between police and protesters in which missiles were thrown at officers. Six people were arrested during the day - two for assault on a police officer, one for carrying Class A drugs, one for criminal damage, one for going equipped to cause criminal damage, and one for failing to give a name and address after anti-social behaviour. Alex Harvey, one of the campaigners at the camp, said the "siege" at BAA would last until Monday morning. She said it would remain peaceful, but she could not guarantee it would be lawful. "There are certainly times when unlawful action is required in order to force changes that aren't happening fast enough," she said. Police said there had been some "pushing and shoving" between the two sides as protesters approached the BAA site. Commander Jo Kaye of the Metropolitan Police said: "We've policed a number of marches and actions. The number of officers and the types of tactics used has varied based on the situation with which we have been faced. "I have stated right from the start that what we want to do is facilitate lawful protest, that is our duty and something we are committed to doing. "We have had a very limited dialogue with the organisers and I would call for more - especially as they are continuing with their phase of mass action." BAA has said it will not be commenting on the day of action. Protesters have been at the camp - situated between the M4 motorway and the airport's northern perimeter in west London - for a week. Activities have included talks and workshops and some sporadic direct action, such as protesters locking themselves to the gates of a nearby Israeli firm which flies produce to the UK. On Sunday, protesters left the camp in separate groups at midday to begin their march to the BAA site. Some protesters and members of the local community symbolically walked the 3km (1.8 mile) route of Heathrow's proposed third runway. Banners carried slogans such as "You Fly, They Die", "Climate Change Kills" and "No Third Runway: Sipson Village RIP". Three teenage protesters scaled a fence near BAA, and unfurled a banner saying "Make Planes History". 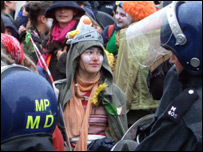 Protester Layla Harris said: "We have had enough of the prioritisation of economic growth over the future of our planet. "We are part of a growing global movement of ordinary people that will stop climate change." Are you at the protest or can see what is happening? Send us your photos and moving images to yourpics@bbc.co.uk or text them to 07725 100 100 - see right hand side for terms and conditions on sending pictures.